Just before the colors of Fall cover the Earth, Carnelian blazes in her glory of brilliant orange as one of the birthstones of August. One last flash of warmth before the Earth gives way to her cooler wardrobe. The warmth of this stone fills us with creativity and motivation to move forward with endurance, courage and confidence. 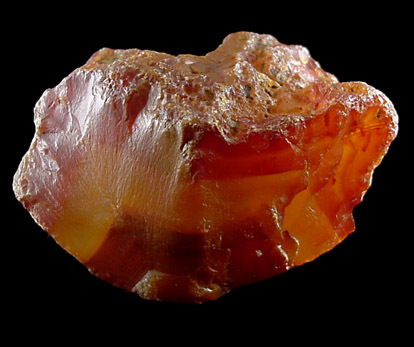 Carnelian, like Peridot, is one of the stones placed in the breastplate of Aaron. It obtained top honor as the first stone in the breastplate because of the belief that it signified the blood of the martyrs. It was also once believed that it could prevent illness and Plague. Known by the ancient Egyptians as "the setting sun" carnelian was traditionally worn to enhance passion, love and desire. This makes me wonder if Cleopatra might of had a few of these hidden in her robes. Today it is also treasured for these traits. Carnelian is a form of Quartz. It is also sometimes called Cornelian. The name carnelian comes from the Latin word carneus, which means fleshy, a reference to the color of the stone. Carnelian can range in color from reddish orange to brownish, yellow, red, or pink. The various shades of red depend on the amount of iron oxide present in each stone. Stones can be faintly banded, or uniform in color. Carnelian rates a.6.5 on the hardness scale and is transparent to sub translucent.